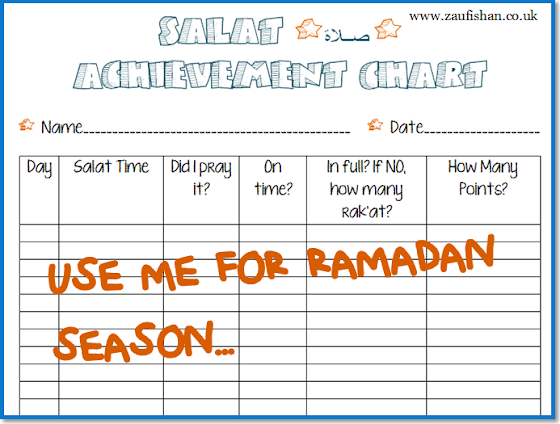 Get a copy of the sparkly Salah Achievement Chart and compete to win prizes by praying with brilliance. In Islam, Salah, the prayer, is sacrosanct. It is obligatory. There is no getting around it, over it, or under it, and no amount of excuses can justify how and why a believer chooses to leave it. Despite all our humanly errors, there is no apology for cheating this sacred principle, and neglecting the act of remembering God, which if one remembers the hadith, is the difference between belief and rejection, between imaan and kufr, between life and death. From the beginning of time and the first human, prayer is the life source for all of creation. This is the reason prophetic narrations have reminded us why plants make remembrance of God, how animals' unknown languages are a hidden type of revelation and how each raindrop, a single falling molecule of life, is brought down by an angel, that is also in continual hamd, praise of God. If there was one thing you should teach your children, it would be to pray with heart, to make du`a, and if there was one last rite you could perform before dying, it would be surrender to God through a prayer. Ramadan is another one of those sacred signs that bring unity to creation. The light shines brightly when people are collectively doing right. Before this we were falling off the path, losing balance on it, being pushed right off the straight and narrow bridge. Ramadan arrives like a safety net, teaching us to climb back on to the most direct route to God, and teaches us through self-development how to stay on that path. The Prayer. "Your career should be like prayer in congregation: if a space opens before you, step into it." In my family, good deed charts were introduced when I was a young child. My mother made a straightforward table on the prehistoric Macintosh, titling it 'My Good Deed Chart' and gave us these 8x6" copies to stick into our books. This was a novel table for us and we were so excited to have a visual account on how many duties we fulfilled in one day. Who prayed all five prayers? Who gave money-less charity? Who took the time out to contribute to chores or learn a new du`a? Now that we're older, my siblings and I have our own take on the good deed chart and a prayer chart. The competition still exists though! For this Ramadan I updated our traditional Salah chart with the Salah Achievement chart. This is specifically designed to encapsulate the quantity of prayer units, all the while ensuring good attendance, understanding and quality are maintained on an individual level. I don't think everybody will answer the same to "Did you pray with khushu?" My brother jokes that khushu is the dragon from Disney's Mulan. It's not. I have thus and henceforth given a copy of the Salah Achievement Chart to my siblings aged 20 and under, my sweet young cousin who is 7 years old, and my parents who have a combined age of 103. May Allah accept it from me and from them, ameen. Allahu-akbar. - Did The Answer To My Istikhara Come In My Dreams? - Video: The Prayer At Its Proper Time, "As-Salaatu 'ala Waqtiha"
The link has been disabled. Is there a way to still download the Salat Achievement Chart?